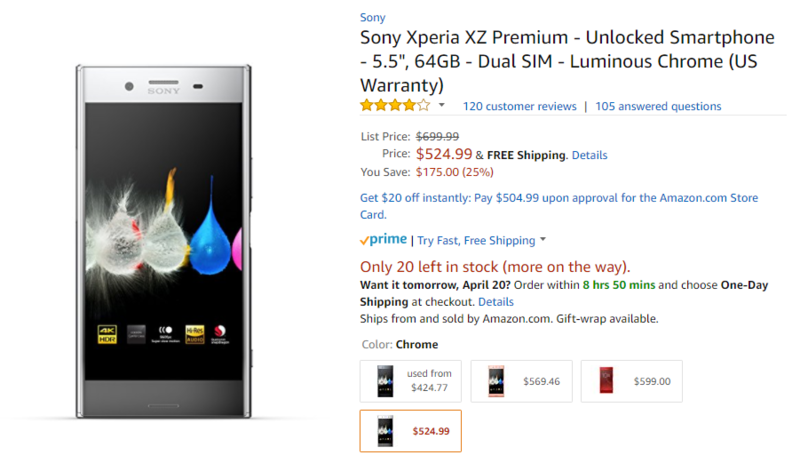 The XZ Premium launched for $799 at first, but then the MSRP was lowered to a more approachable $699. It's still the quoted price now, though recently the phone has settled around $600. $525 is less than that still and the lowest we've seen it reach. The XZ Premium carries Sony's older blocky design language, but the specs are very respectable: 5.5" 4K HDR display, Snapdragon 835, 64GB storage with MicroSD slot, 4GB RAM, 19MP camera with 960fps video recording, and 3230mAh battery. Only the chrome color is discounted on Amazon to the low $525 price and there are 20 units left at the time of writing, so you better make up your mind quickly.